All frontline nursing staff, managers and directors for the five acute units have received Medworxx training, compliance rates for entering patient information/status is generally above 70 percent on all units, and Medworxx is now being used in rCare rounds to support better patient care. o How is my patient doing today? o What is being done for my patient today? o What are we doing to help discharge my patient in a safe and timely way? o What are the barriers/delays to discharging my patient and what do we need to do to get past them? Medworxx monitors patient stay, highlights care delays, assesses discharge readiness, supports optimal care and standardized process across the health system, offers decision support, and provides operational and trending analysis. It also supports decision making at all levels from the bedside to the boardroom and supports process improvement identification and management. Benefits of the system include improved patient flow, reduced length of stay, improved identification of and processes around alternate level of care, reduced emergency department wait times, reduced readmission rates, and greater transparency through improved knowledge of care delays. 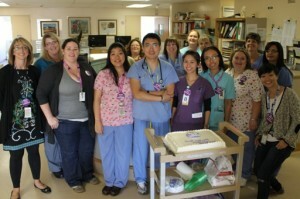 Both Lions Gate Hospital and Richmond Hospital have implemented Medworxx. RH chose a frontline model, which means that all frontline nurses in acute will be entering/updating their patient status, using Medworxx in rCare to discuss discharge planning, and ensuring that the entire interdisciplinary team has access to the most current information on the patient. Medworxx does not replace daily charting and it is not a documentation system. It is a communication tool and a decision support tool requiring clinical judgment. So what is next? We will be working to have more consistent data, and integrating Medworxx more fully into rCare. In addition, within the next few months, we will be rolling out Phase II of the project which will result in a refresh of the look and the implementation of assessment tools.